Many, but not all, chronic pain patients have reported ceasing their use of opioids entirely, or at least requiring less medication to get pain relief after adding cannabis to their regimen. Other pills with unwanted side effects, such as sedating muscle relaxers or neuropathic pain medications, are being reduced by our patients as well. A surprising number of patients find that topical cannabis (i.e. lotions, balms), which tends to absorb too slowly to cause any psychoactive “high” typically associated with THC, is a great day time option – especially for deep-seated issues like back pain related to herniated discs. Naturally (or rather, un-naturally) not all physicians are on board with their patients using our clinics, and some will even go so far as to cease prescribing pain medications to cannabis patients for various reasons. Not everyone is fully convinced by the constantly evolving evidence that cannabis is beneficial for pain. However, unlike opioid “pill mills” that existed to churn prescriptions out to patients, we aren’t here to give widespread access to a medication that the vast majority of doctors would restrict patients from having. Maryland imposes monthly limits and a common complaint is that prices are still higher than those on the streets or in D.C., especially for vape oils. Anyone attempting to divert medical cannabis would be a pretty poor business person. In most cases, we exist to give patients access to a medication that many doctors are unable to prescribe due to it’s Schedule 1 status, even despite their support. Many individuals, in particular Veterans Affairs patients, mention their doctor’s interest in them trying cannabis to reduce opioid use or to relieve their PTSD symptoms. However, due to hospital or group practice policies, they cannot openly write cannabis recommendations. Other physicians will even write referral notes or letters outright stating they believe the patient would benefit from medical cannabis. For some, this is simply because they don’t feel comfortable officially recommending cannabis, since medical schools do not really teach the endocannabinoid system and the research is limited. An unexpectedly more consistent success we’ve observed has been patients replacing their benzodiazepines with cannabis for panic attacks and insomnia. While not necessarily as dangerous as opioids, these medications are still highly addictive and long-term use is proving to be potentially dangerous, especially in elderly populations. Improved sleep from using proper strains also leads to reports of better overall wellness from a surprising number of patients. We are excited to find that new sleep products focused on CBN (cannabinol) over THC are showing up in Maryland now too. Not all psychiatrists are on board with medical cannabis, but some mental health care providers are actively referring patients to the program. They’ve seen benefits like reduced medication use and reduced psychiatric hospitalizations. Nonetheless, caution is prudent, especially due to mixed evidence for THC on anxiety, depression and PTSD. Despite the lingering stigma that it’s a gateway drug and often being viewed as a form of substance abuse, cannabis is no doubt safer than benzodiazepines (and arguably alcohol) in many ways despite it’s inappropriate Schedule 1 status. Removing drug dealers with access to narcotics from of the equation makes things even safer for patients who seek cannabis for medical use. Furthermore, there are safer ways to use cannabis for anxiety and PTSD that only dispensaries tend to provide. Green Health Docs has found success in educating patients on the safe and proper use of cannabis to minimize psychoactive highs and unwanted side effects, even before the patient heads over to a dispensary. By requiring patients to bring in records that prove their existing qualifying condition(s), we can focus less time on diagnosis and more on asking pertinent questions and educating them in using cannabis as a medication. From the very beginning, our clinic has promoted using high CBD (cannabidiol) strains due to CBD reducing the activity of THC at the CB1 receptors in the brain that lead to psychoactive effects. When dispensaries first opened, there were mostly high THC strains available and a few rare strains with equal parts CBD and THC. However, we encouraged many of our patients to ask for strains like ACDC or Harlequin due to their higher concentrations of CBD and very low concentrations of THC. We’d like to think that the ever increasing presence of these types of strains is in part due to many provider’s patients demanding their availability. Many patients end up claiming they prefer these strains since they still provide relief, but with minimal impairment and adverse effects. We’re excited to see the program evolve and can’t wait to see how things have improved in another year for patients. If you are interested in renewing your certification or becoming a new medical cannabis patient, Green Health Docs providers and staff will be happy to discuss the possible medical benefits and side effects of cannabis use with you. We also broadcast our educational sessions on YouTube and Facebook. 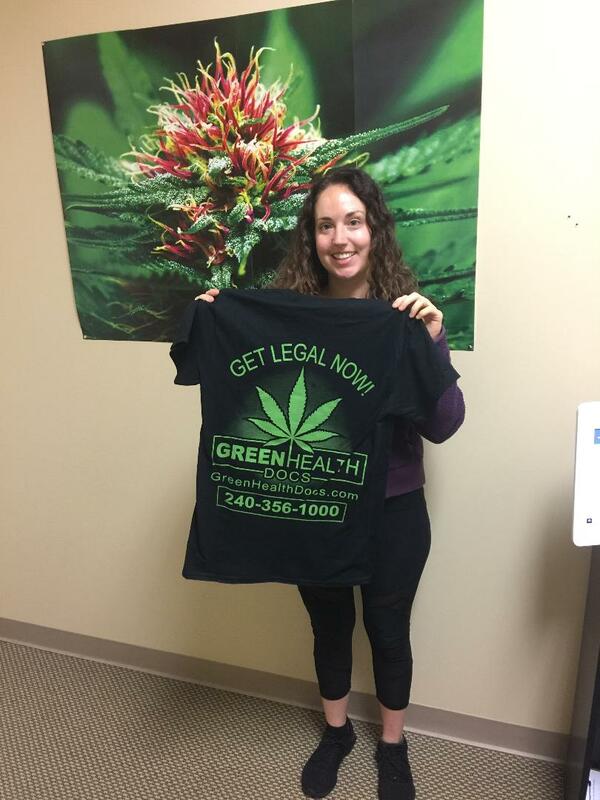 For more information or to learn how to become a legal medical cannabis patient, call or text us at 240-356-1000.